Hillary's attacks Bernie for being soft on Iran. That line didn't work out so well for her in '08. Hillary’s Latest Attack on Bernie Sounds a Lot Like Her Attack on Obama in ’08. Uh Oh. 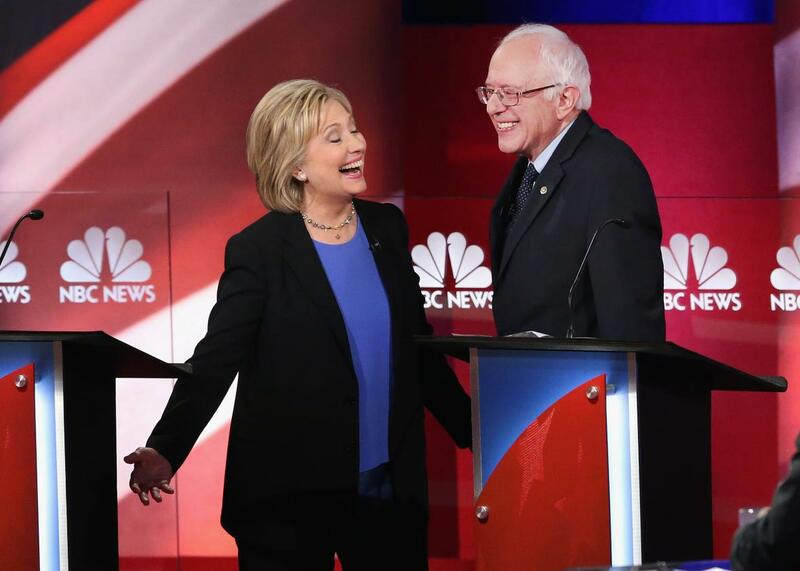 Hillary Clinton and Bernie Sanders chat following the Democratic Candidates Debate hosted by NBC News and YouTube on Jan. 17, 2016 in Charleston, South Carolina. With the Democratic primary contest growing closer, Hillary Clinton’s campaign is opening fire on Bernie Sanders’ foreign policy ideas, such as they are, namely his suggestion in a recent debate that the U.S. should move “aggressively” to normalize relations with Iran. “This proposal to more aggressively normalize relations and to move to warm relations with Iran not only breaks with President Obama’s policy, it breaks with the sober and responsible diplomatic approach that’s been working for the United States,” former State Department staffer and Clinton adviser Jake Sullivan said Thursday. “The proposal would not succeed, but it would cause very real consternation among our allies and partners.” Then, several other campaign surrogates piled on. I think what we’ve got to do is move as aggressively as we can to normalize relations with Iran. Understanding that Iran’s behavior in so many ways is something that we disagree with; their support of terrorism, the anti-American rhetoric that we’re hearing from of their leadership is something that is not acceptable. On the other hand, the fact that we’ve managed to reach an agreement, something that I’ve very strongly supported that prevents Iran from getting a nuclear weapon and we did that without going to war. And that I believe we’re seeing a thaw in our relationship with Iran is a very positive step. So if your question is, do I want to see that relationship become more positive in the future? Yes. Can I tell you that we should open an embassy in Tehran tomorrow? No, I don’t think we should. But I think the goal has go to be as we’ve done with Cuba, to move in warm relations with a very powerful and important country in this world. The thing about Sanders’ foreign policy views is that he generally seems very uncomfortable discussing them, something even his supporters concede. The Nation’s editorial endorsing his candidacy noted that ﻿ “The senator hasn’t talked as much as we would like about global challenges and opportunities, and we urge him to focus more on foreign policy.” Much more at ease on domestic economic issues, he often seems to be constructing his foreign policy on the fly, and some of his notions, such as the idea that Saudi and Iranian ground troops could work together to pacify Syria, rely on an awful lot of magical thinking. So it’s certainly fair for a former secretary of state to attack the senator’s lack of foregn policy experience or know-how. But positioning herself to the right of her opponent on diplomacy with Iran in a Democratic primary didn’t work out well for her last time, and given recent events, it’s hard to imagine it will work better now.